Good morning my dears! I hope your week is going well. Mine has become unexpectedly busy, but I made sure to carve out some time for today's Thrifted Kitchen. 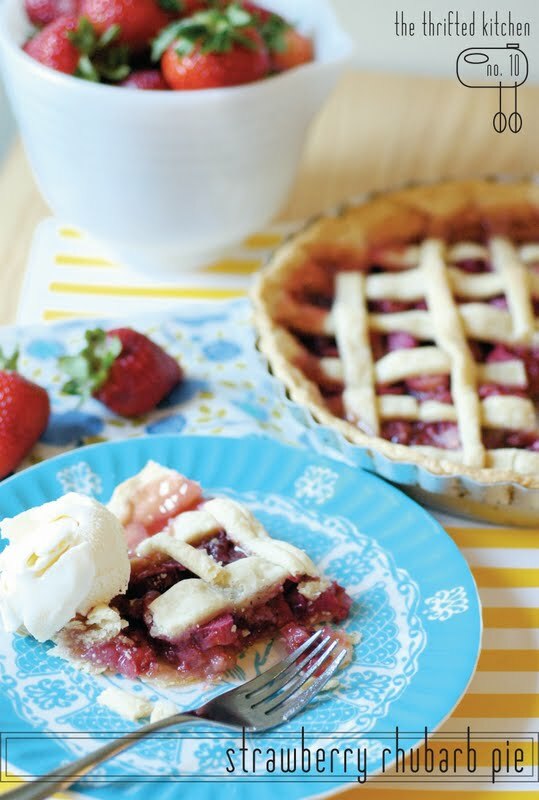 Right now, strawberry and rhubarb are in season, and I've been itching to make a pie from them. I found a recipe online that looked really good, but then I picked up that stack of vintage Better Homes and Gardens I thrifted a while back, and on the cover of the June 1966 issue was exactly what I was looking for! In a large bowl, combine sugar, tapioca, salt and nutmeg. Add rhubarb and strawberries; mix well to coat fruit. Let stand about 20 minutes. Spoon fruit mixture into pastry-lined 9-inch pie plate. Dot with the butter or margarine. Moisten pastry edge. Top with lattice crust; flute edge. Bake in hot oven (400 degrees) for 35 to 40 minutes. 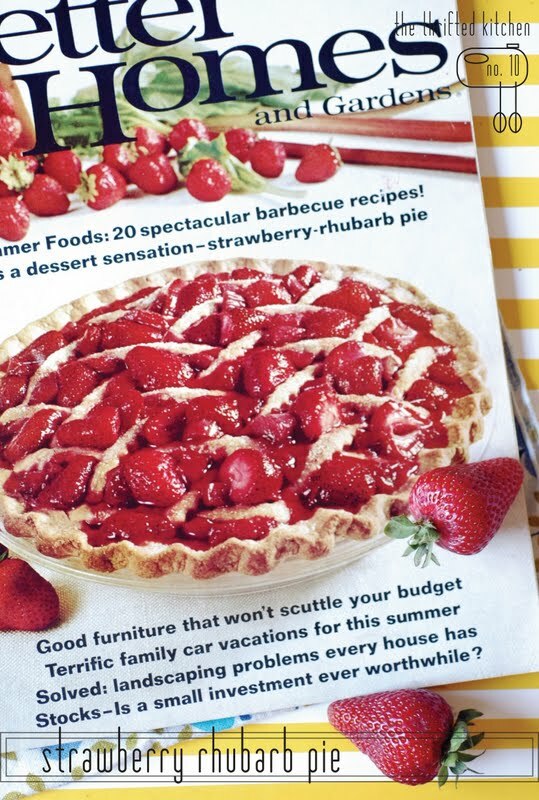 If desired, decorate lattice top with additional sliced fresh strawberries dipped in melted currant jelly. Sift together flour and salt. Cut in shortening with pastry blender till pieces are size of small peas. 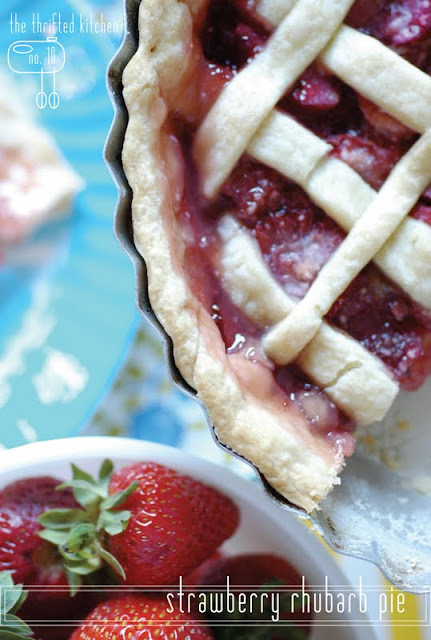 (To make pastry extra tender and flaky, divide shortening in half. Cut in first half till mixture resembles corn meal. Then cut in remaining half till like small peas.) Sprinkle with water, a tablespoon at a time, gently tossing with fork till all is moistened. Divide dough in half and form in two balls; chill. On lightly floured surface, roll one half of the dough to fit a 9-inch pie plate. Transfer to pie plate; trim 1/2 inch beyond rim. For lattice top: Roll out second half of dough; with pastry wheel, cut in strips about 1/2 inch wide and 12 inches long. Lay strips over fruit filling and 1-inch intervals. Fold back alternate strips to weave over and under in crosswise pattern. Trim even with outer rim of pie plate. Moisten edge; fold lower crust over strips. Seal and flute edge. I am in awe of your cooking skills! And I love that the inspiration for a lot of your cooking is classics from the past.